Based on a TIME magazine interview conducted today with President-Elect Donald Trump, the pharmaceutical and life science industries may expect to find coal in their Christmas stocking, and tougher pricing constraints in 2017. Barron’s acknowledged that, “Trump Comments on Drug Prices Sink Biotech.” Among stocks that took price hits on 7 December following the TIME comments were Incyte, Celgene, both down 5%; Vertex, Illumina, Mylan, and Regeneron, down 4%. The SPDR S&P Pharmaceutical ETF fell 3.4%, and iShares NASDAQ Bioetch ETF was down 4.2% at one point on the day. 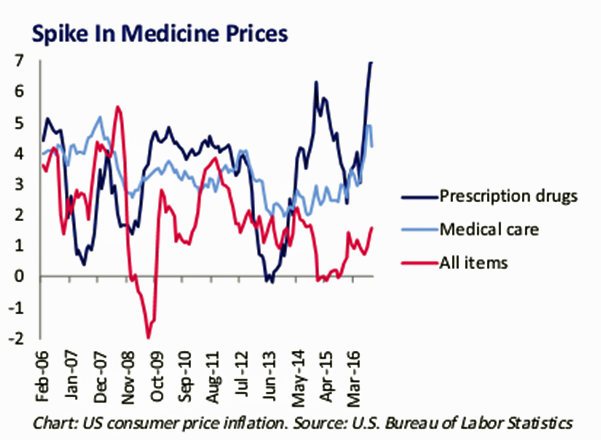 Health Populi’s Hot Points: Check out the link graph, which illustrates prescription drug price inflation fluctuations compared with medical care and general consumer price inflation (sourced from the U.S. Bureau of Labor Statistics). The issue of drug pricing hit popular culture status in 2016 based on the EpiPen pricing story, on top of the past two years’ stories of Gilead’s Hepatitis C drug pricing (for Harvoni and Sovaldi), and the demonization of Martin Shkreli of Turing Ph armaceuticals, called, “The Bad Boy of Pharma” by the New York Times one year ago. Note the September 12, 2016, People magazine coverage (pictured in “Passages” image) of the EpiPen, which I noted inside the issue featuring Rob Kardashian’s impending fatherhood. From an investment standpoint, DoctoRx of Seeking Alpha recommends investors take a long view looking at industry fundamentals and the fact that it’s hard to cut health benefits. But in this new-new era of President Trump, what’s past is not prologue. I’m expecting public support of more stringent drug pricing regimes moving closer to European nations’ constraints and value-based evaluations using health economics outcomes research (HEOR).